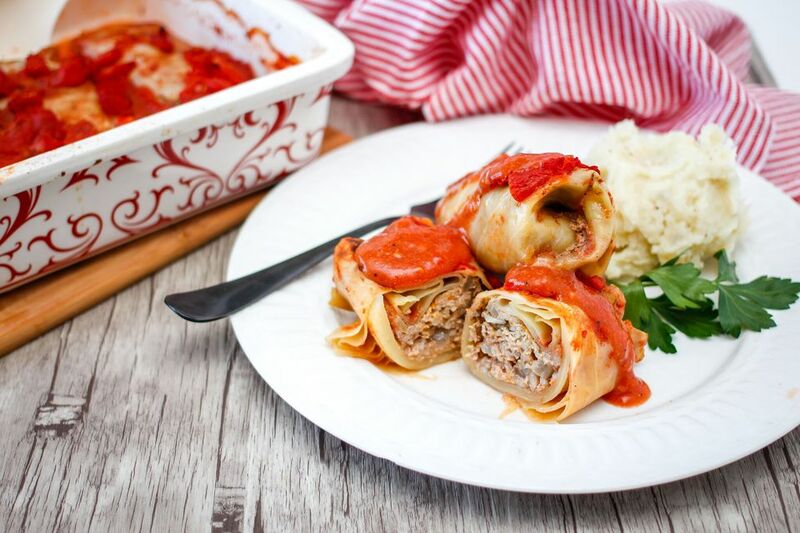 These cabbage rolls are stuffed with ground beef and rice and baked to perfection with a tangy tomato sauce. Cabbage rolls are a favorite comfort food, a dish that might be reserved for special occasions. This recipe for stuffed cabbage rolls is a very popular recipe. Here's a method for softening the cabbage leaves that cuts time significantly. The night before you plan to make the cabbage rolls put the whole head of cabbage in the freezer. Take it out in the morning and give it the rest of the day or several hours to thaw. The leaves of the thawed cabbage will peel off easily and are flexible enough to stuff with no pre-cooking required! The meat isn't cooked ahead of time, so try to use very lean ground beef to avoid the excess fat. At the very least, use 85% lean ground beef or leaner. The night before you will be making the cabbage rolls put a head of cabbage in the freezer. Take it out the next morning to thaw during the day. Peel about 12 to 15 large leaves off of the cabbage head. They should be flexible enough to fill without blanching. If you are not working with a frozen, thawed head of cabbage, carefully peel off about 12 to 15 large leaves from the raw cabbage. Drop the cabbage leaves into boiling salted water; cover and cook for 3 minutes. Drain well. For filling, combine ground beef, rice, onion, egg, and salt, pepper, and milk. Mix well and divide into 12 portions. Place a portion of the beef mixture onto the center of each cabbage leaf. Roll the leaf around the filling, burrito-style. Fasten the rolls with toothpicks. Place the rolls in a baking dish or oven-safe Dutch oven. For the sauce, combine the tomato sauce, tomatoes, sugar, vinegar, and 1/2 cup of water. Pour over the cabbage rolls. Cover and bake in the preheated oven for about 1 hour. Remove the rolls with a slotted spoon and discard the toothpicks. Place pan with juices over medium heat or transfer the juices to a saucepan and place over medium heat; stir cornstarch and water mixture into the sauce; bring to a boil and cook until thickened. Serve the cabbage rolls with the sauce. Serve cabbage rolls with boiled potatoes or mashed potatoes. Drizzle sauce over the potatoes. For a side vegetable, choose steamed green beans, corn, or broccoli. Low-Carb Option: Replace the rice with steamed cauliflower rice. If you are looking for cabbage roll flavor but are short on time, take a look at this "unstuffed" skillet version, or this easy beef and cabbage slow cooker dinner.